Last October, several hundred pastors gathered at the Creation Museum for our sold-out Answers for Pastors and Christian Leaders conference. Our 2018 theme was the clarity of Scripture—a doctrine that is increasingly coming under attack. And three of the sessions from this encouraging conference are now available on video. In this three-video pack, you’ll hear from Dr. John MacArthur, of Grace to You, and me. I spoke on Acts chapters 2 and 17 and how to effectively present the gospel in our increasingly secular age. I also shared a message on the clarity of Scripture and the relevance of Genesis. Dr. MacArthur powerfully addressed the issue of the sufficiency of Scripture, highlighting that God’s Word is enough. 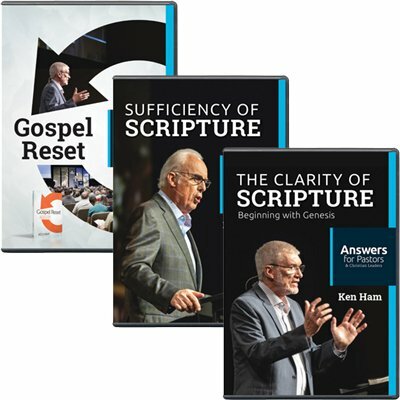 I encourage you to order this powerful DVD set or download the set for your home library and consider ordering an extra copy for your pastor or other church leaders. Our theme for our 2019 Answers for Pastors and Christian Leaders conference (October 8–10, 2019) is “One Race, One Blood: Biblical and Scientific Answers.” You’ll hear powerful messages on the issue of race from Dr. Voddie Baucham, Jr., Dr. Charles Ware, Dr. Johnny Hunt, Joe Owen, Dr. Terry Mortenson, Dr. Georgia Purdom, Bodie Hodge, and me. This conference, taking place in the Answers Center at the Ark Encounter, is extremely timely to the world we live in today, and your church leadership won’t want to miss it. I encourage you to let them know about this Bible-upholding conference and mention that it’s being held within walking distance of the life-size Noah’s Ark, south of Cincinnati. Learn more on the events page of our website. This item was written with the assistance of AiG’s research team.